Shari Lewis and her sock puppets were among the biggest stars of children's television in the 1950s to 1970s. In addition to performing, Lewis also wrote and produced shows for young viewers and won 12 Emmys, 7 Parents' Choice Awards, a Peabody Award and an Action for Children's Television Award during her career. She also wrote more than 60 books. Shari Lewis is currently considered a "single author." If one or more works are by a distinct, homonymous authors, go ahead and split the author. 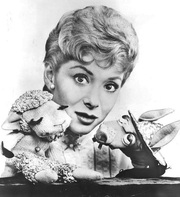 Shari Lewis is composed of 3 names. You can examine and separate out names.